Marek Kwiek published a new paper in Science and Public Policy (Oxford University Press): “Academic Top Earners. Research productivity, prestige generation, and salary patterns in European universities“. 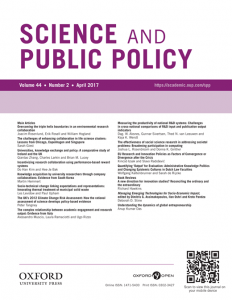 Science and Public Policy, 45(1), February 2018, 1–13. doi: 10.1093/scipol/scx020. His previous paper for Science and Public Policy was published in 2012: “Changing higher education policies: From the deinstitutionalization to the reinstitutionalization of the research mission in Polish universities“. Sci Public Policy (2012) 39 (5): 641-654. DOI: https://doi.org/10.1093/scipol/scs042, and can be dowloaded here.